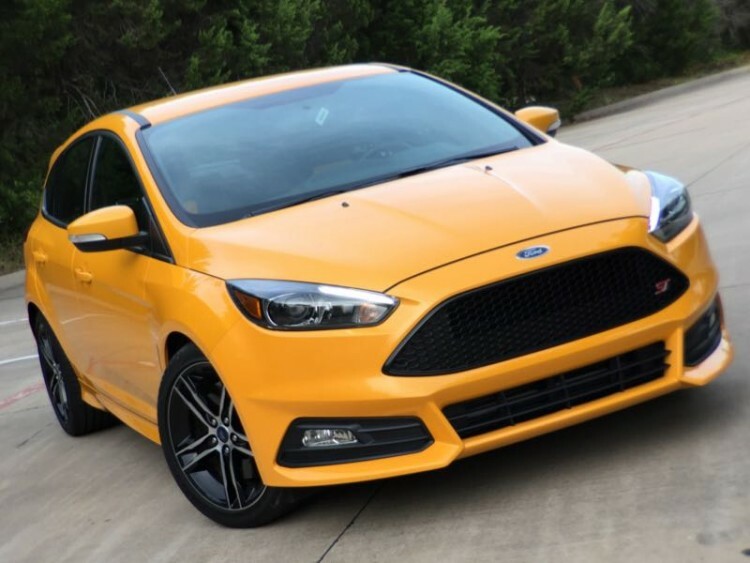 While U.S. consumers eagerly await the arrival of Ford’s global rally car, the Focus RS, we enjoy zipping around town (or the track) in the sport tuned Focus ST that received some upgrades for the 2015 model year. We spent time recently checking out the updated driving dynamics (steering and suspension) along with styling changes inside and out. The ST lineup of small vehicles from Ford arrive as more compact versions of Ford’s SVT vehicles we have come to love to drive over the past couple of decades. These modified production cars and trucks feature enhancements to suspension systems, powertrains, and interior and styling packages that take mild-mannered street vehicles and transform them into something you can take to any track event on the weekend. 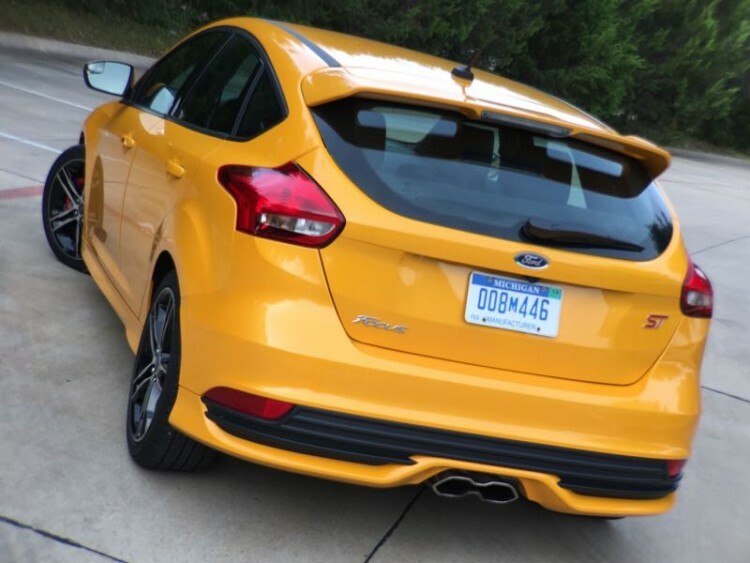 Fortunately I have had the opportunity to spend a little time in both the Focus ST and its little brother Fiesta ST at Ford’s Proving Grounds in Dearborn, Michigan last summer and I had a blast in back-to-back seat time in this little dynamic duo. On the small autocross course set up for journalists I believe I enjoyed the Fiesta ST better than the Focus ST as the smaller car performed more optimally in its powerband with quicker recovery times through twisties, etc. The Focus ST seems to really enjoy stretching its legs on longer runs as it winds out more in the gears. 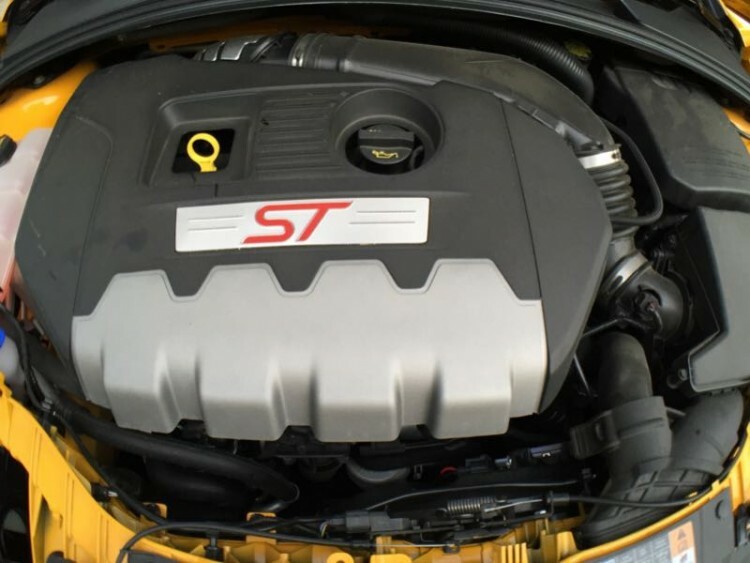 The Focus ST is more at home on a larger road course track than a tighter, smaller autocross. 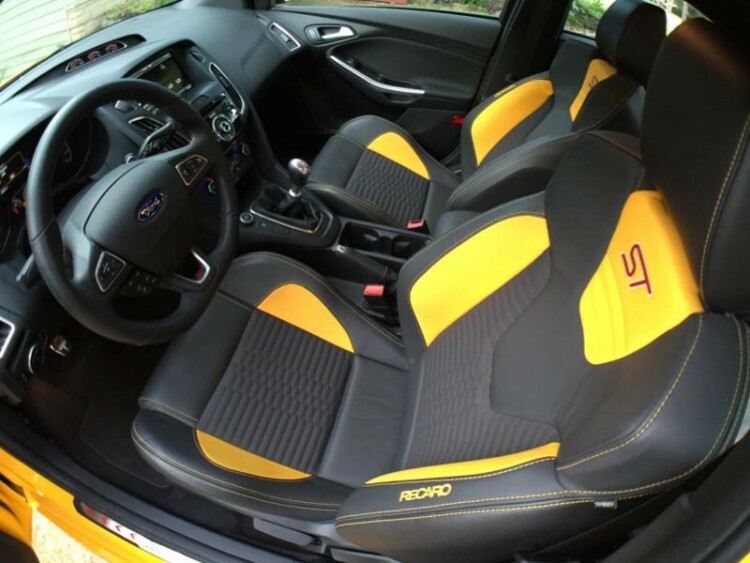 Some of the key enhancements for the 2015 Focus ST include a flat-bottom steering wheel (that you can order with a heat function now) along with a revised instrument panel center stack that includes upgraded USB ports with more power available. Outside we see new front and rear fascia for a sportier look and the new 18-inch alloy wheels show off red painted brake calipers a bit better. Powering this fun little car is the turbocharged, high-output 2.0-liter EcoBoost I-4 engine generating 252hp and 270 lb. ft. of torque to the front wheels. This engine is mated to a six-speed manual gearbox (NO automatic availability) with short-throw shifter. This drivetrain features enhanced torque vectoring control with cornering understeer control (which basically means engineers are doing just about everything they can to help you keep this car on the road). The only other thing the Focus ST needs is available all-wheel drive and that is coming on the RS next year. 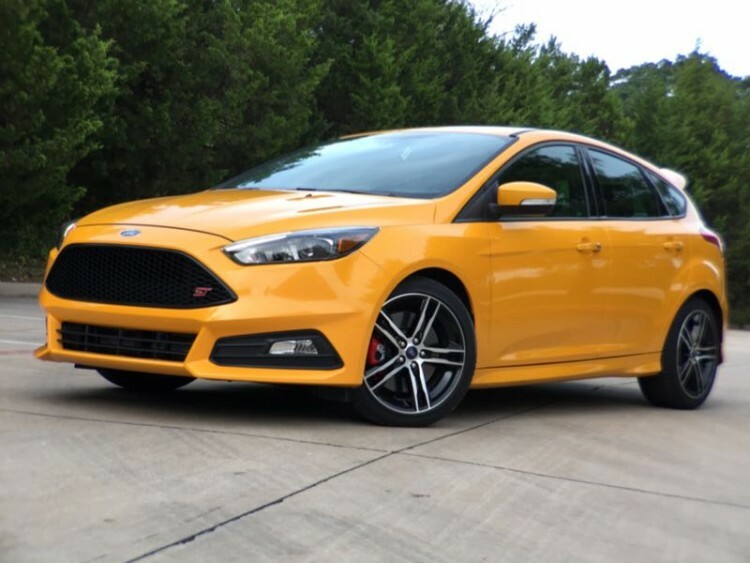 Engineers have revised suspension tuning in the 2015 Focus ST with new front springs and enhanced shock damping front and rear and have given the electric power-assisted steering better control and improved feedback for an overall better steering feel for a sporty car. In addition to more aggressive styling front and rear the new Focus ST gets a lower and wider stance and a new, more sculpted hood. The sports body kit features body color side skirts and diffuser elements along with a rear roof spoiler and twin-hexagonal center tailpipes to finish off at the rear. The redesigned cabin makes for a more intuitive layout including a bank of three gauges atop the dash panel above the center stack to show turbocharger boost output, oil temperature, and oil pressure. 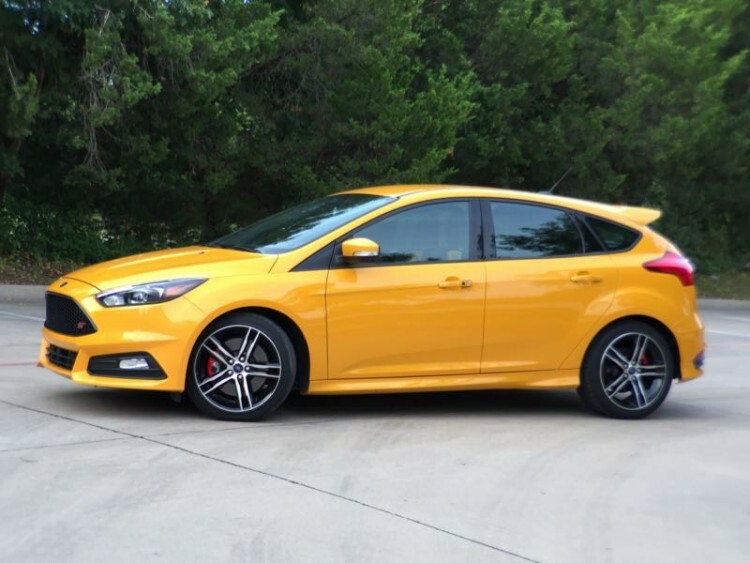 The 2015 Ford Focus ST is offered in three trim levels (ST1, ST2, and ST3). Our recent tester was middle of the road in ST2 form but came with wickedly supportive Recaro sport bucket seats up front. Base price is $24,370 with our tester arriving with a final sticker of $30,070. EPA ratings for the Focus ST are 23 mpg city and 32 mpg highway. We had a blast driving this car around town and on the track in Dearborn. The ST lineup of small cars from Ford is a fun one dedicated to providing a dynamic driving experience and we cannot wait for the arrival of the RS rally car next year.